William's dream blog put me in mind of a similar venture I undertook a few years ago. For several months, I was fascinated with my dreams, recalling and recording them each morning. Hoping to share my treasure, I searched out an on-line dream forum, only to discover thousands of dreams exactly like mine. Like a penny collection whose value evaporates when you take it into a coin shop, my magical dreams now seemed commonplace. I stopped recording them, though I still enjoy them. A few days ago, I pulled Sigmund Freud's On Dreams from the bookcase. Like Einstein's The ABC's of Relativity and Kant's Groundwork for a Metaphysics of Morals, On Dreams is a short work by a seminal thinker introducing a complex theory to non-expert readers. Freud begins from the premise that dreams originate with the dreamer; they are not, in other words, messages from without or intimations of the future. They have their origin in unfulfilled wishes. When we dream, a psychic process (called the dream work) transforms these unfulfilled wishes (dream thoughts) into scenes (dream contents). Dream contents are concocted from everyday experience, distorted and combined in ways that disguise their origins. Their significance be can discovered only through the power of free association. As dream thoughts are transformed into dream contents, meanings attached to thoughts are displaced onto elements of content which are only obliquely connected to them - so that the true meaning of the dream is masked. The wish for revenge in the thought is transformed into the barking dog of the dream through a chain of associations imbedded in the brain of the dreamer. At the same time, the bits and pieces of our experience - all those people, places, and situations that show up in our dreams - are conflated into dream images of ambiguous identity, as multiple memories are condensed into a single dream element. A person in my dream can be both my brother Kevin and my son Anselm; I can be in Hanley Hills and Amagansett at the same time. As Freud says, "'No" seems not to exist as far as dreams are concerned". In addition to transforming, displacing, and condensing, dream work often involves another task: tying the dream contents together into a semi-coherent narrative. Freud is tentative about how this process works. He suggests it might take place after all elements of the dream are formed - like putting a facade on a finished building. I know what he is talking about, but my impression is that this process takes place on the fly; as each new dream element develops, it generates links to previous elements, leaving the impression that the dream fragments are connected into a coherent whole. What is all this about? 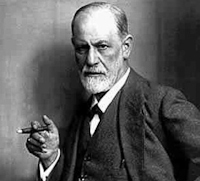 What is Freud ever all about? Repression of primitive sexual impulses that cannot be expressed or acknowledged by the waking consciousness. While we are awake, Freud says, we continuously guard against expression of our repressed wishes, but when we sleep, our consciousness lets down its guard - though not entirely. While it does not entertain repressed wishes directly, it does admit them in a transformed, attenuated form. In a chapter on the function of dreams, Freud argues that dreams are guardians of sleep. If we were to wake every time a wish pushed itself into our sleeping consciousness, he says, we would be up all night. Instead, we have developed a way to respond to our wishes without getting out of bed - by fulfilling them in dreams. What about dreams that disturb sleep, rather than protect it? Freud compares dream work to a night watchman who allows citizens to sleep by quelling disturbances, but sounds the alarm when he encounters a danger he cannot handle. Yikes! it's time to wake up.